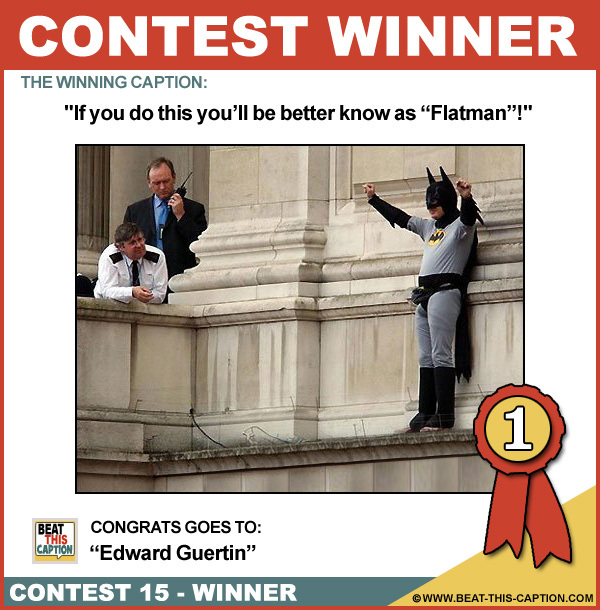 Beat This Caption Contest 15 Winner – Caption Contest Funny Clever Witty Enter Today! False alarm sir, it’s just Conan doing a stunt…! If you do this you’ll be better know as “Flatman”! Sir, trick-or-treating should be done INSIDE the building! Hmmm, ok, you’re right. The curtains would look stupid there! C’mon man, what super-hero has to stuff his crotch! Is Robin in your underwear? He says this i the only place he can get a good reception on his cellphone! Haaaaaaaaaaa told you I can be a pigeon! How do I know Batman’s gay? two words, Fanny Pack…!